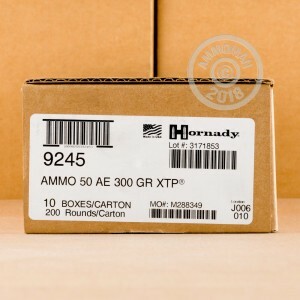 Hornady designed these 50 Action Express rounds with the infamous extreme terminal performance (XTP) hollow point projectiles. With a muzzle velocity of 1,475 feet per second and a weight of 300 grains, these loads will deliver optimal knockdown power and precision. 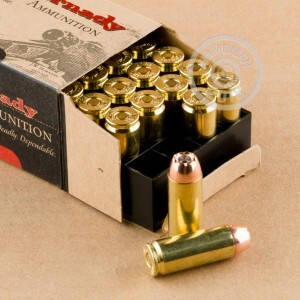 Hornady ensures these rounds are built with the highest quality primers and powders for increased accuracy and supreme performance. "Accurate. Deadly. Dependable." Three of the most essential words when choosing your ammunition. 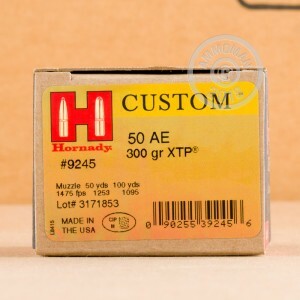 As one of the most influential leaders in the industry, you can trust that Hornady delivers on their promises. Get this spectacular box of 50 AE right now!